The PERMANENT book was published way back in 1998, so there is information in it which is very outdated, but it still provides a basic introduction to near Earth asteroids, lunar resources, how to mine them, space colonies, etc. We still have a limited supply in stock, in case you like to read a paper book, and for some people it has become a collector's item. A picture of the front and back covers of the PERMANENT book are given below. The size of the book is 8.5 x 11 inches, or approximately size A4. The PERMANENT book has been very well received by both the professional and layman communities. interest in space habitats and commerce ... I'll pass your book on to my collaborator..."
A description of the book is given below, followed by ordering instructions. 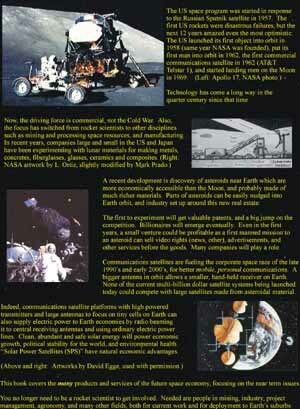 PERMANENT is an acronym for Projects to Employ Resources of the Moon and Asteroids Near Earth in the Near Term. 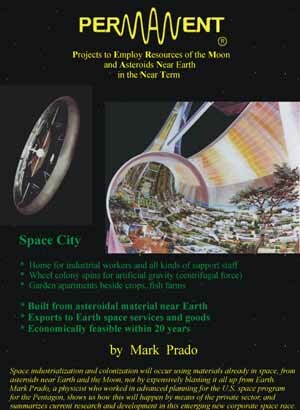 The book, titled "PERMANENT", by Mark Prado (see brief bio below), covers near future, large scale development of space using materials already in space -- asteroids near Earth and the Moon -- rather than expensively blasting it all up from Earth. After all, the Europeans who settled America didn't ship over their bricks and cement. Emphasis is placed on explaining the basic concepts and issues for layman advocates and managers to understand, relevant events and institutional resources to date, and the next stage -- private sector development of space resources -- supported by practical near term products and services in space. Make no mistake -- the next space race will be between multinationals, not between governments. The book is 275 pages, of size A4 (8.5 x 11 inches), and is paperback. The book is shipping by air to anywhere in the world. This book is not one that just predicts the far future from the sittingpoint of an armchair intellectual. While it has a fascinating and entertaining vision with many pictures, it is all on the immediate future, the next steps required to get there, and ways you can get involved in making this happen in your generation, now. Out of all geologic time in Earth's history, it is OUR generation that will get life off of the planetary cradle! Immortality is also a race against time, as we develop the technology to destroy our species, e.g., biological weapons, or inadvertantly engineering a virus to make it deadly (like Ebola) and spread much more easily, or nanotechnology self-replicators running amok. Already, we are destroying life on Earth out of greed, making extinct a significant percentage of Earth's species in a matter of only a hundred years. We need to develop space, and move some kinds of biotechnology experiments outside of our biosphere, as well as much of industry. This book is about free enterprise space development -- space commercialization, industrialization and real colonization. You don't need to work for NASA to become involved. You can send us e-mail and get in on the ground level to do this as a private multinational. Just as the internet was on the fringe in the 1980s but became the boom industry with many of the best stocks of the 1990s, space resources is poised for the next decade's cutting edge sector. The most dynamic and fascinating part of the space program has yet to come, and it will unfold in the first decade of the 21st century. If you are going to have a chance of getting involved in this process, you need to know things in this book as a prerequisite. This is your chance, and there's no good reason to wait. The book introduces you to an understanding of the basics, then the current research and development entities and resources, and issues that businesses need to understand for implementing the next steps. No other book exists on the market which takes this practical, near-term and implementational approach. However, like certain other books on the same general subject, this one is written for the layman. Technical information deemed beyond the scope of the 275 page book was set aside for the advanced website, but that information won't be worth much unless you understand what's in the book. If you are a researcher, then I suggest you also consider forwarding a copy of this notice to your associates and library so that others will appreciate the relevancy of your work. Many kinds of people will be needed outside of the present NASA-contracting community. We will need professionals experienced in mining, materials processing, manufacturing, construction, project management, and of course finance and investments. We will also need agronomists, waste management specialists, all kinds of secretarial and other support staff, and good public relations people. Those who get involved early will be better positioned for the rest of their careers. The business model will not be a conventional American aerospace one, and we will not need many rocket scientists at all. The business model will be one akin to multinational mining and manufacturing in remote places on Earth -- simply transplanting it to space. Mark Prado is an American physicist who worked in advanced planning in the US space program, and who now is a consultant working overseas for multinational engineering and construction companies operating in remote parts of the world, which is akin to the business model for developing resources in remote places in space. Notably, Mr. Prado began his career working for the U.S. Patent Office (before changing work to the above two fields), which provided insider skills in applying for patents, which is crucial for private sector entities. The PERMANENT book costs US$28.50 if shipped to anywhere in the USA, or $44 elsewhere, and we now offer the convenience of e-commerce for credit card payments (worldwide orders including U.S.) or check (U.S. only), courtesy of 2CheckOut.com. Once we have received this information, we will send you a Payment Request e-mail, containing a special URL linking to an online order page on 2CheckOut.com's secure servers in the U.S. You never give us any credit card or bank account details. Book buyers get enhanced services on the website. For example, we keep a list of additions and changes to the website, so that you can quickly see what's new. You can access this list if you buy the book, whereby we give you a username and password. This will mean that you won't have to re-read old articles to see if there's anything new, and you won't miss anything significant that is added to the website. Feedback from book buyers, however, is that it's simply nice to have a paperback book in hand for leisurely reading anywhere, anytime, rather than always at the computer. I hope this is the kind of thing you want to do with your life, and that you will join us for improving life on Earth as well as for insuring the future of life from Earth. If you are in a country with a weak currency or have a low income, then we might consider sending you a book at no cost to you if you have a useful small service you can barter in return.